Stepping into Overture is an unique experience itself; eating Bertus Basson’s exquisite cuisine takes the whole experience to another dimension. The menu only reflects the best of what’s on offer. The clean flavours, the perfectly crafted dishes, and the outstanding and attentive wait staff are some of the many reasons why this is one of the best restaurants, not only in the winelands, but also in South Africa. 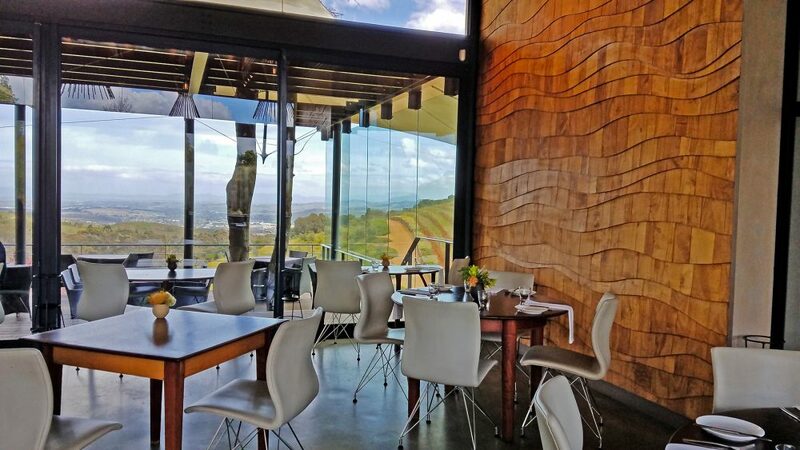 Be prepared for spectacular views, fabulous wines, and innovative cuisine when you visit the Restaurant at Waterkloof. If you are a foodie, eating at this Helderberg institution should be at the top of your list. The excellence of the food and service will dazzle you. The amuse bouche will surprise your taste buds, the well-balanced dishes will satisfy your appetite, and the on-hand sommelier’s mastery will surely impress you. 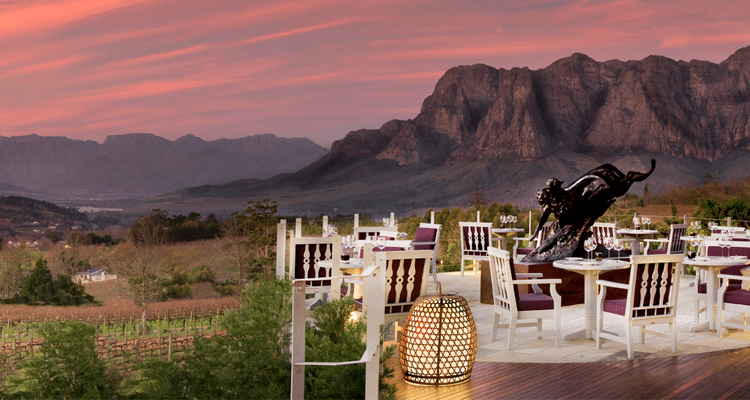 Perfectly positioned for watching the sun go down, the restaurant at De Grendel offers diners an unrivalled view across the city of Cape Town and Table Mountain, as well as incredibly tasty food. Using fresh local produce, the chefs create an array of imaginative dishes that are matched perfectly with the fine wines of the estate. Choose a table inside the restaurant or opt for a table outside on the patio on warm summer evenings. Delaire Graff is a refined, elegant, and prestigious place you should go to when you are in the mood for a special celebration. The restaurant is ideal for those who love spectacular settings. You will be pleased with the warm welcome and top-notch service. The cuisine is a combination of rich gastronomy mixed with surprising but tasteful ingredients. It is a must-do for all the food lovers who are in search of different savours. 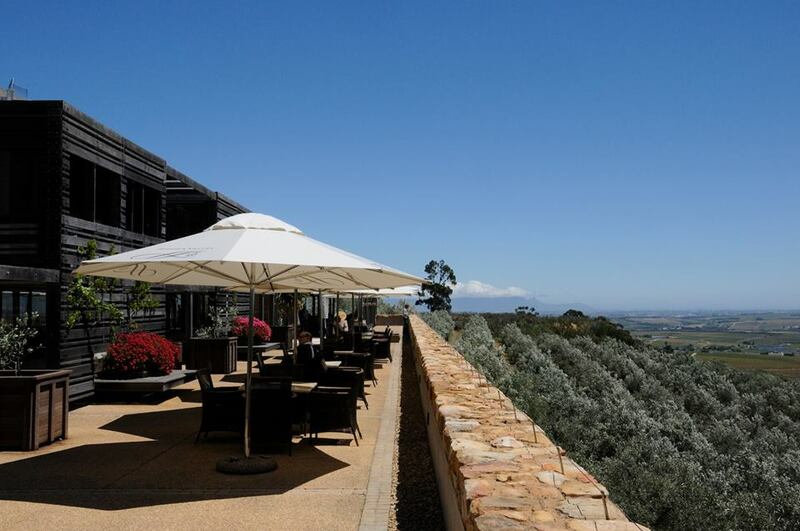 The excellent reputation of Chef Richard Carstens is usually what draws people to Tokara, but the view is certainly not to shabby either. From the moment you enter this splendid venue, the staff ensures that you have the most pleasurable experience. Saying that the food is exquisite is an understatement. The chef shows his deep knowledge of the local gastronomy and deserves all the credit and praise he gets. 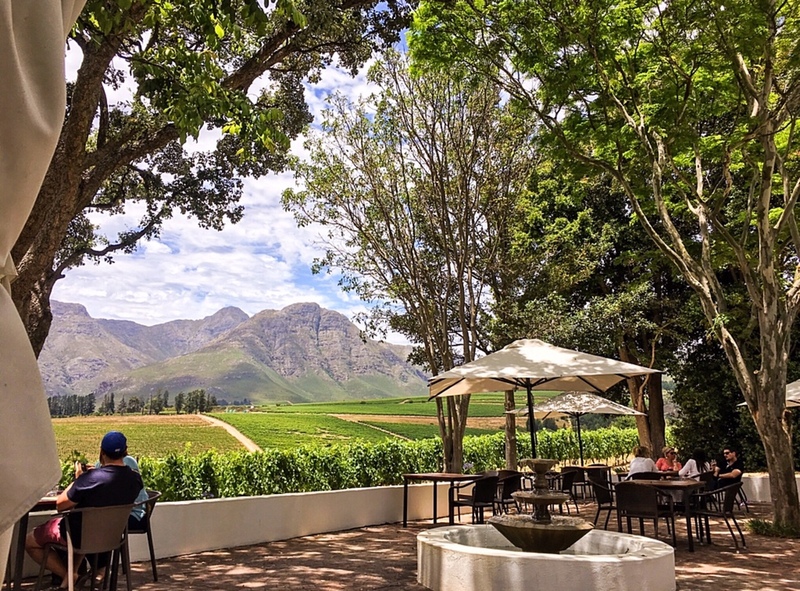 No trip to South Africa is complete without a visit to Franschhoek and if you are looking for a restaurant with a great view over the majestic valley then this is the place. La Petite Ferme offers a breathtaking experience in views and romantic dining. Modern cuisine is the main style of the restaurant, with inspiration gathered from all over the world. However traditional preparation and cooking methods give the dishes an old-style twist. Be sure to call ahead for a reservation, as this popular spot usually has a packed house. An airy space flanked by alfresco dining terrace, the Restaurant at Glen Carlou offers a welcoming atmosphere for relaxed dining. A U-shaped bar fronts the restaurant, where smooth wood finishes are offset by the classic brickwork of an oversized fireplace under the glow of abundant natural light. The menu offers cuisine with substance — in-season rather than trendy. It’s a place where simple, seasonally-inspired dishes are paired with a curated selection of wines by the popular wine estate. Foodies and wine lovers alike love Chef Liam Thomlin’s modern restaurant which serves excellent and eye-catching menu items. The restaurant is nestled among hectares of vineyards, with stunning views from just about every angle. As well as the aesthetic benefits of its location, the proximity between vineyard and kitchen provides the perfect opportunity for collaboration between the two professions, which translates beautifully to the table in the form of their innovative, wine-inspired, seasonal cuisine. 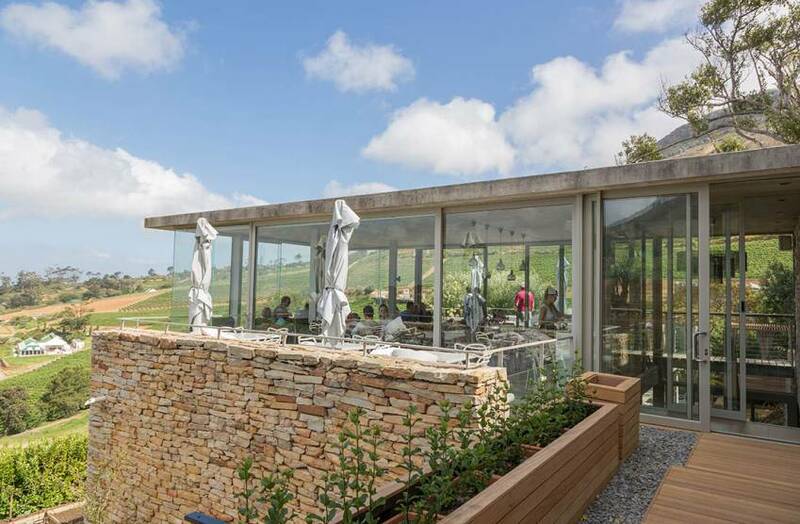 The Longtable restaurant at Haskell Vineyards in Stellenbosch reopened in March following an extensive makeover. The menu, with Chef Charles Joubert at the helm, reflects seasonal produce with an elemental cooking style highlighting one or two ingredients at a time. The open deck restaurant terrace allows you to experience the seasons with the bright orange and red hues of fall, or the plentiful yellow mustard throughout the vineyards in winter. 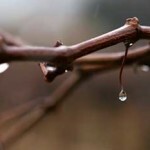 See the trees blooming and the vineyard buds breaking in spring, or enjoy the colourful sunsets in the summer. 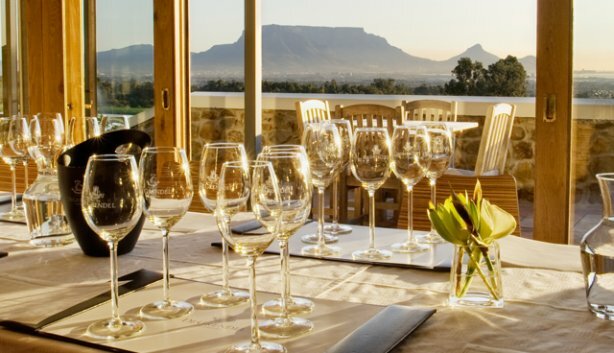 Idiom Restaurant offers guests a casual fine dining experience with the opportunity to taste Idiom’s flagship blends and signature Italian varietal wines, while gazing out over the Helderberg mountains. Rows of vines span out below the terrace and the full profile of the Cape Peninsula from Table Mountain to Cape Point are visible in the distance. 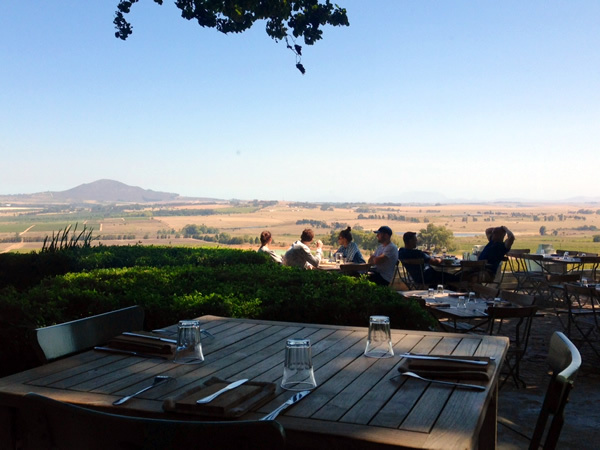 Relax and take in one of the best views wine country has to offer at the restaurant at Cavalli Estate. Executive Chef Michael Deg creates an evolving menu that highlights fresh and seasonal ingredients. 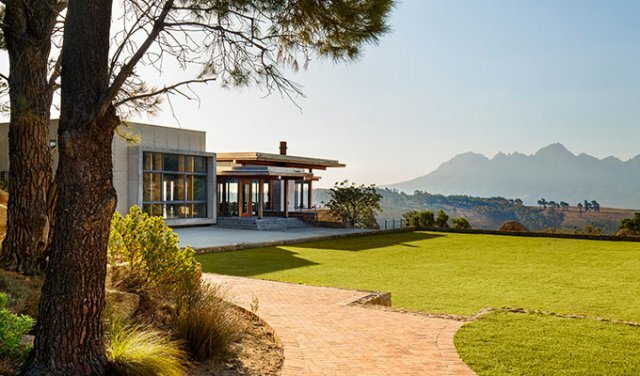 The venue boosts breathtaking sights with panoramic views of historic Stellenbosch vineyards against a backdrop of the majestic Helderberg Mountains. The glass-enclosed conservatory takes advantage of the stunning mountain views and a 60-year-old Fuschia Pink Pride of India tree that blooms abundantly over the summer season. Whether you fancy lunch on the patio or splash out at dinner, Jordan Restaurant is a fashionable destination in the winelands. The focus on the flavours of locally sourced, seasonal ingredients is evident, from chef George Jardine’s kitchen vegetable and herb garden to wine barrel fish smoker and wood-fired oven. 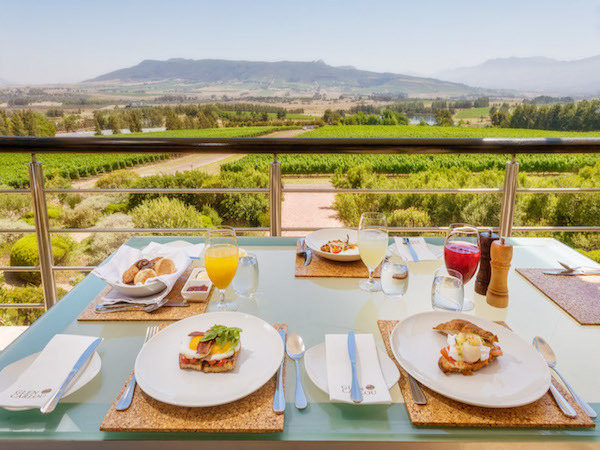 With al fresco dining terraces overlooking the property’s green spaces and dam, an evening here is an immersive experience in Stellenbosch wine country. Chef Bertus Basson has become known for his love and commitment to heritage food and his restaurant at Spice Route flies that flag with pride. The establishment offers lovely views over the Boland and guests can enjoy a leisurely lunch under the oak trees or on the stoep from where you can embrace the beautiful natural surroundings. The Spice Route Destination also gives visitors the rare opportunity to sample wine, craft beer, gin, and charcuterie at one location. 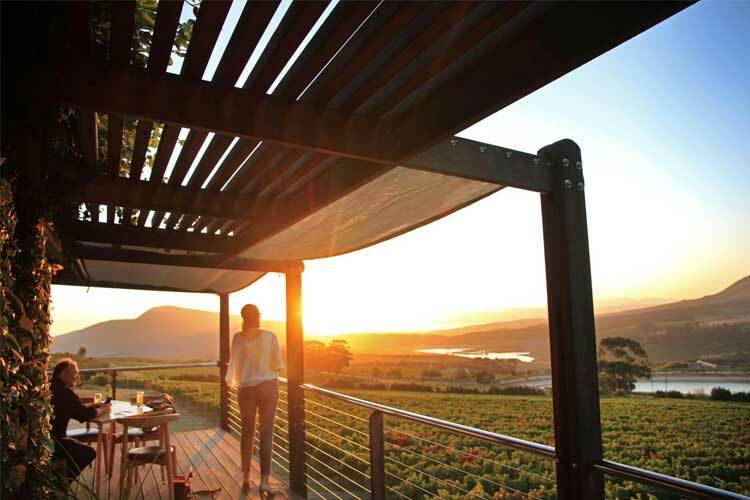 With spectacular views of mountains and vineyards leading down to the nearby Atlantic Ocean, The Restaurant at Newton Johnson is situated on a wine farm in the Upper Hemel-and-Aarde Valley just outside the seaside town of Hermanus. Chef Ricky Broekhoven uses homegrown ingredients to create delicate dishes that are layered with flavour. 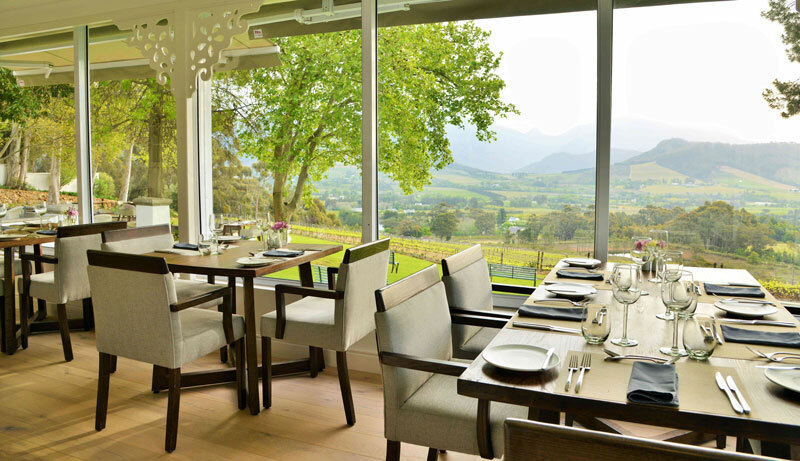 Sweeping views of the surrounding vineyards are the icing on the cake at the Restaurant at Clos Malverne in Stellenbosch. Guests are invited to enjoy a languid afternoon on the balcony, where you become one with nature with the vineyards right there in front of you. The place has all the right ingredients, including award-winning wines, a diverse, world-inspired menu and priceless views. 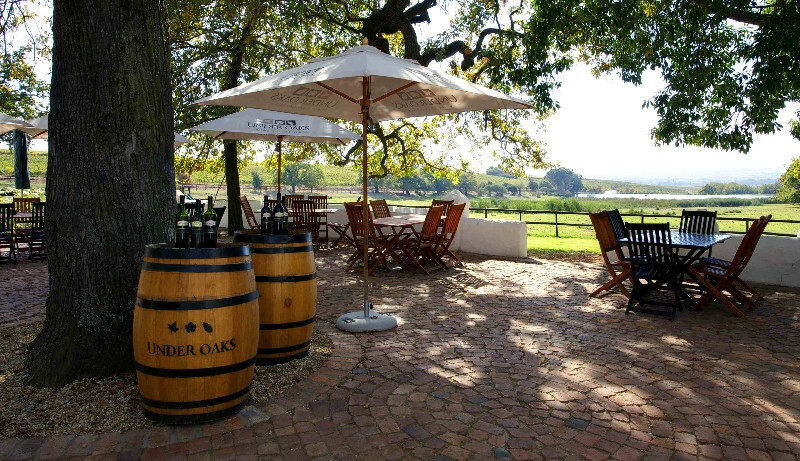 Immerse yourself in South African wine country at Under Oaks, located just outside Paarl. 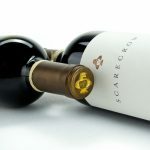 Offering panoramic views of the surrounding valley from its expansive outdoor dining area, the restaurant provides an ideal place for wine lovers to unwind. The pizzas are the best in the west. Wash it down with a craft beer or one of the estate’s fine wines.